One Day More Fitness Blog: My NASM Personal Trainer Journey - Getting Ready for the Certifications Exam! My NASM Personal Trainer Journey - Getting Ready for the Certifications Exam! Welcome back for part thirteen of my weekly blog posts on my journey to becoming a personal trainer. Today I'm going to talk about how I'm preparing for the NASM-CPT Certification Exam! This has been a long week of studying, more studying, taking practice quizzes and exams and even more studying! As I mentioned earlier in this blog I moved my exam up by a week because I didn't want to obsesses about it for an extra week and because I want to take while the knowledge is fresh in my head so my exam is now on July 26th which, if you look at the calendar, is only 5 days away. That's okay though because I'm feeling a lot better about it after spending this entire past week digging down deep into studying and practicing. I'm using a couple different resources to help with practice quizzes and exams. 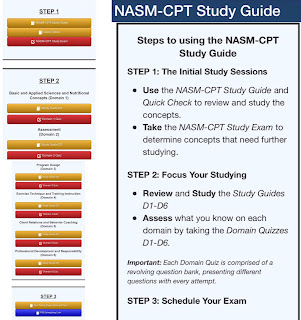 1) Obviously I'm using the official NASM site and the NASM-CPT Study Guide Module (which is the image posted above). 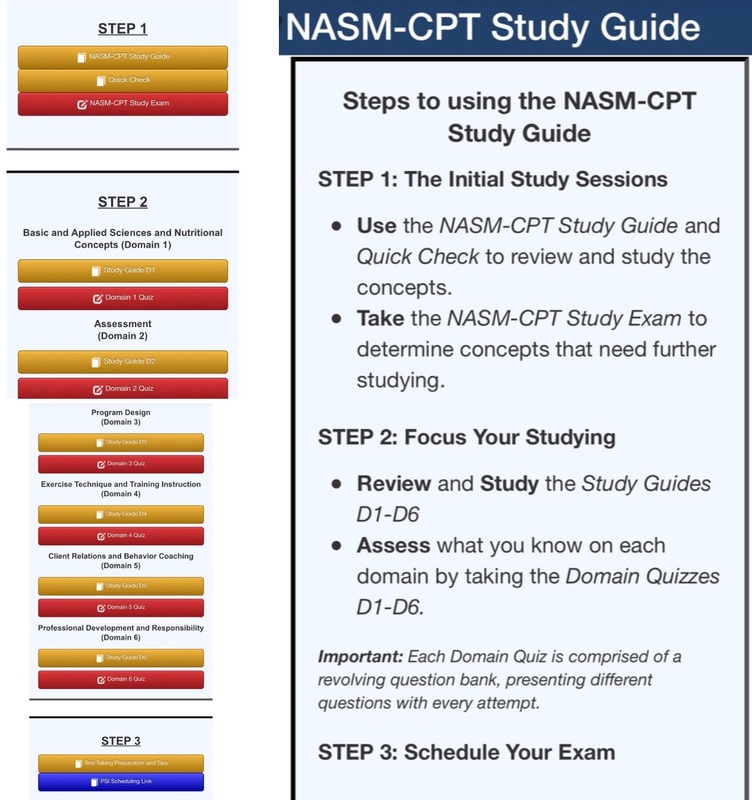 This module gives me a 100-question study exam, all of the NASM study guide broken down into domains and a domain quiz for each of those domains. I've taken the 100-question study exam five times in the last week and a half and I'm pretty much taking every domain quiz once a day because the question bank changes every time you take it. I've also gone over the NASM study guide a couple of times and my own study guide once all the way through so far and I have rewatched every module video for the last 10 modules. I plan to fully go through my homemade study guide at least once more and over the domain NASM study guides several more times. 2) Beyond NASM, I am also taking the practice quizzes and the 120-question practice exams on the FitnessMentors website. 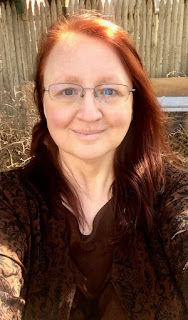 As I've posted previously on my blog, I did have to pay out of pocket for the quizzes and exams but I have found them to be invaluable to my studying and I'm really hoping they help me with my certification exam. I'm finding that the questions on those exams are, while not more difficult than the NASM ones (although some sure felt that way), they are phrased differently and some of them touch on topics I didn't really see in the official NASM practice quizzes so they really make me think about everything I've learned so far instead of just what's showing up on the domain quizzes. I'm taking at least one (out of three 120-question exams) practice exams every day and have yet to get everything correct on any of them. 3) As I've stated over and over again, I'm also using the NASM CPT Pocket Prep app on my phone that I've been using all along. Honestly, the questions on that app are a lot more difficult than the ones on the NASM site and I'm still getting some of them incorrect when I practice which is why I keep retaking them throughout the day. The way I practice on the app is that I do the daily question of the day, I answer the "quick 10 question" quiz several times a day and I've taken two 100-question exams so far when I had time for them. This app also phrases questions somewhat differently than my other two sources and I have found the questions on there to be much harder than ones I've seen anywhere else. Basically, I figure I can get the best of all worlds by utilizing all of these sources daily and really challenging my brain and my knowledge. I'm also starting to get much better results with doing all this. I'm passing the NASM quizzes with anywhere from 88-100 correct, I've gotten 88 or higher on the NASM study exam so far and I'm scoring in the 80's and 90's on the app and on the FitnessMentors site. I'm really hoping that all of this translates into me passing my certification exam this coming Thursday but, of course, there are no guarantees because the certification exam has a bank of 500 questions and my 120 questions on the exam could be any of those. My fear is that I'll end up with all the questions I'm still somewhat unsure about which is why most of my day consists of studying, memorizing and practicing over and over and over again. And, this is basically what my week will look like until Thursday which is exam day (I need to be in Rutland by 11:30 and it's at least an hour drive but I'm leaving early just to make sure I get there nice and early and don't get lost) with hopefully some gym thrown in for some mental relaxation. I think that covers it for now so I'm going back to studying! 5 days left!